Cards on the table, I had never heard anything by Xandria; I knew nothing about them, but then I was sent an email with an embedded video of one of their songs and the tour dates, one of which was in striking distance, and I thought "this might be worth catching". Therefore, off we went, a bit further up North, to a venue I am familiar with, but also to a room that I wasn't. It was small. There was probably room for a hundred to a hundred and twenty-five people in there, and there were three bands on – "could be a squeeze tonight" I thought. First up was a band called Aonia and what surprised me was the fact that they had not one, but two female vocalists, neither of which was a backing singer. If you take Heart out of the equation, I can't think of another band that has this set-up, certainly not in the Symphonic/Goth Metal genre. The two singers definitely complemented each other, and the music didn't lose any impetus throughout the set, and they received a very good reception from the crowd. The really weird thing I found out later was that the two vocalists both came from my home town, and yet I didn't know anything about them. The second band Metaprism also had two singers, but one of which was male this time, just like Lacuna Coil, and that was the problem – they tried too hard to be Lacuna Coil. The male vocal was of the growl and grunt variety, which I have never really liked, and which annoys me when I know he can sing, which he did very occasionally. While I said that they tried to be Lacuna, they didn't achieve their aim as there was not a lot to latch onto, no melodic, memorable choruses for instance, as with Lacuna. Still, that was just my opinion, and again, the audience seemed to appreciate them, but I think, like me, they got more from the first band. 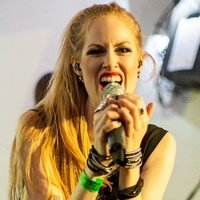 Anybody who knows about Xandria will know that things haven't been very smoothly for them recently, having lost singer Dianne Van Giersbergen (no relation to Anneke – I know, unbelievable isn't it?) earlier in the year, and they had to find a suitable replacement. I would assume that those here to see them tonight would have been aware of this fact, and so the next ninety minutes or so would be an assessment and comparison session regarding replacement Aeva Maurelle. Not an easy position to be in. When I said I would be interested in covering this show, one person I know said he would be very interested to hear my thoughts on the replacement singer as "she has very big boots to fill". I can tell you most emphatically, she filled 'em with consummate ease. To be honest with you, the further into the show we got, the more she reminded me of Tarja (Turunen) from Nightwish and there's not many people that can pull that off successfully. Her communication with the audience was good, to the extent that she took a mobile phone from somebody in the audience and then went around the stage and filmed every band member before she returned the phone. 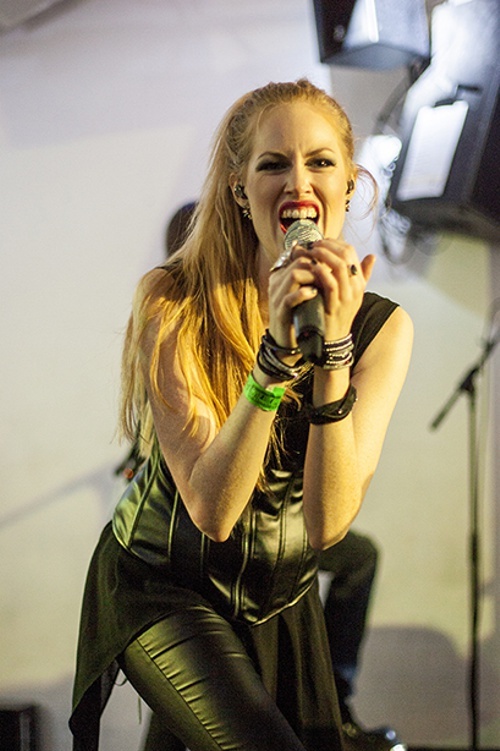 You would never have known she had been with Xandria for a short time as she performed like a long-standing member. She also told a story about a girl who went to a Xandria concert by mistake and decided that was what she wanted to do in future. It was, of course, herself she was talking about, and she got a round of applause for that, so they must have liked her. The whole band was tight and looked comfortable on what, to be fair, was a small stage, although bass player Steven Wussow must have felt a little restricted as he came down from the stage to play amid the crowd. I would recommend anyone who likes this type of music to check them out when they get the chance, and after witnessing this performance, I think Maurelle and Xandria have a bit of thinking to do... but not that much. Set-list (copied from sheet) – 'Where The Heart Is Home', 'Unembraced', 'Call Of Destiny', 'Euphoria', 'Forsaken Love', 'Until The End', 'Ravenheart', 'Come With Me', 'Death To The Holy', 'Nightfall', 'Undiscovered Land', 'Murderers', 'Voyage Of The Fallen', 'Cursed'. Encore; 'Burn Me', 'Valentine'.